Technology has an incredible way of both making our lives easier and more complicated all at the same time. When you add a piece of technology into your life – no matter what it is – it usually will help you in some ways while also giving you another chore to take care of on a regular basis. Such is the case with distance measuring technology on the golf course. Things like GPS units and laser rangefinders are great for providing you with the numbers you need to hit quality shots, but they also give you another gadget to keep track of throughout your round. With that said, the best distance measuring devices are those that balance giving you the numbers you need without really getting in the way. For its part, the Bushnell Neo XS Golf GPS Rangefinder Watch does a great job of information delivery without standing in the way of your game. Worn around your wrist, this device is always there when you need information and yet you can easily forget about it when not looking for a yardage. If you are used to wearing a watch in other walks of life, wearing this product on the course will quickly become second nature. Many golfers turned to laser rangefinders and never looked back when they were faced with the prospect of having to download courses and pay membership fees to use a GPS device. However, the GPS landscape has changed, so you should consider one of these units once again if you had previous sworn them off. With the Neo XS Golf GPS Rangefinder Watch, as is the case with most modern GPS devices for golf, there is no membership to maintain, and there are no courses to download prior to hitting the links. When you purchase this product, it will come preloaded with more than 33,000 courses in more than 30 different countries. The database of courses is almost sure to include your own course, and you should also be covered if you decide to travel to play golf. The only active role you really need to take in the management of this device is making sure that it is charged before your round – which is pretty easy, as a single charge is usually good for at least three rounds of golf, if not more. You can charge the watch with a USB cable, and you can download any available software updates through the same cable. It comes with a limited warranty, and is backed by the well-respected Bushnell name. As you know, most distance measuring devices don’t come in watch form. When it comes to rangefinders, they are simply handheld devices with a viewfinder that can be used to select a target and receive a yardage. For other type of GPS devices, there are a number of shapes which are usually meant to be mounted either on the side of a bag or to a cart. 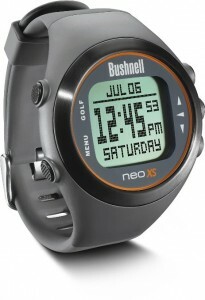 However, this watch design from Bushnell has plenty of advantages, and it is certainly worth consideration. For one thing, you will never have to wonder where your GPS is when you are getting ready to hit your shot. It will also be close at hand (literally), but yet it will never require you to pick it up in order to get a reading. Just glance down at the display like you would with any other watch and you will have to distance you need to plan your shot. As long as you are comfortable making swings with a watch on your wrist – which is something you can get comfortable with after a bit of practice – you should be good to go with this design. When the round is over, simply put the watch away somewhere safe and pull it back out when you arrive at the course once again. No matter how well-designed a GPS distance measuring device may be, it will always have one drawback – it isn’t a laser rangefinder. Simply put, laser devices can do things that GPS units can’t do. That’s just the way it is. Specifically, you won’t be able to pick out various targets on the course to measure when you use a GPS. With a laser rangefinder, you can measure anything that will reflect your signal, meaning you can map out distances to trees, bunkers, slopes, and much more. When you choose to go in the GPS direction, you will be giving up that option. Of course, you will get accurate distances to the front, middle, and back of the greens, – which is great – but your available information will not go much beyond that. With the Neo XS Golf GPS, you will also get some information regarding the distance to bunkers and other hazards, but you will not have control over that information. In other words, if the distance to a specific hazard is not already programmed into the unit, you will not get a measurement for that part of the course. This is a subtle negative that can be quite frustrating when you are unable to get a number to a hazard that just so happens to be in your way. Whether or not you are going to get hung up on the limitations of GPS units as compared to laser rangefinders is up to you. 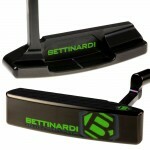 The ability to measure everything on the course might be a nice bonus for you, or it might not be a big deal at all. Think about the way you play the game and decide what information you are going to want to have available in order to play your best. 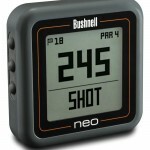 If you do decide to go with a GPS device, the Bushnell Neo XS Golf GPS Rangefinder is a quality pick. The watch design means it will always be right where you left it after the last shot, and it will take only a moment to get your distance for a given shot. With a great price and a solid track record, you are unlikely to be disappointed with this handy device.